It’s not so much the wilderness that keeps me from camping, it’s the logistics. What if we forget to pack something important, like our first aid kit (or corkscrew)? Though camping was foreign to me, I’m all for family travel, so I acquiesced—with one request. “How about a cabin?” I said. 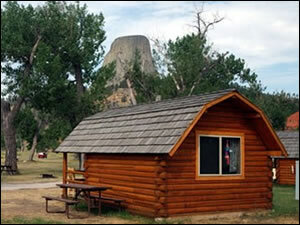 “How about Devils Tower KOA, in Wyoming?” Ethan said, holding up the search results on his phone for me to see. Slow and steady. Ok, let’s see what happens. I’m a pretty tough customer when I vacation, but I was thoroughly impressed with the Park Model cabin we booked for our long weekend getaway. We arrived mid-morning and unpacked (corkscrew: check!). Ethan and I had a private bedroom, and Emily had her pick of futon or sleeping loft. After settling in, we explored the campground. You can tell a family owns the place, because everything a family needs is right there. Emily squealed with each new discovery—the pool, the playground, the arcade and game room. I was just as happy to see the Sweet Shoppe, serving homemade fudge. We enjoyed lunch at the camp’s Cattle Kate's Café—it was so nice to not have to spend this time away in the kitchen—then wasted no time going for a hike around the base of Devils Tower. We stayed on the paved Tower Trail that circles the base. It was an easy, leisurely hike, allowing us to stop to watch a family of cottontail rabbits scurry into the bushes. I took photos of the striking vertical rock towers, while Emily darted in front of us several times to climb on top of boulders. A stop at the Visitor Center was worthwhile for some background on how the tower was formed, and the American Indian legends associated with it. Emily was too young to appreciate the geological history of the place, but it didn’t fail to impress Ethan and me that Devils Tower was named the First National Monument in the U.S. in 1906, before there was even a National Parks Service. After dinner that evening, we made our way to the campfire. We were greeted by other guests and given sticks for roasting marshmallows and making s’mores. A singer with his acoustic guitar was there leading the group in fun camp songs. 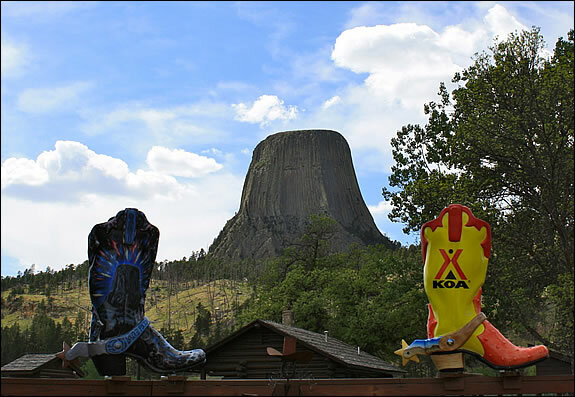 The highlight of the evening was an outdoor showing of “Close Encounters of the Third Kind,” the 1977 movie that was partially filmed at Devils Tower. It’s a thrilling sci-fi classic, but what made it even more eerily exciting was seeing the same Devils Tower rock formation we had hiked around just hours before. Wide-eyed, Emily was rapt watching the alien ship release Barry, a boy just a bit younger than her, who had been brought onboard earlier in the story. As the credits rolled, we retreated to our cabin, humming the memorable five-note tune that the humans used to communicate with the aliens. The next day was all about relaxation. We spent most of it lounging at the pool, responding to Emily’s every request to “Watch this!” as she did underwater handstands and cannonball jumps. Following an early dinner, we headed out for a hayride through the KOA’s ranchlands. Riding along, we could sense the wildlife around us every time we heard leaves rustle. It wasn’t easy to stay quiet, but we were rewarded with a close-up look at a lean red fox, who froze in his tracks and stared at us curiously for a full moment before sprinting away. A bit later, we stopped to let a group of six wild turkeys cross in front of us. Emily giggled at the sound of their gobbling chatter. She tried to converse with them by imitating their sound, but they strutted away. We saw throngs of whitetail deer, and perched on the pine branches above our heads were several types of birds—hawks, swallows and meadowlarks—signing off for the evening with their clipped calls. As we progressed, we watched the sky over the grassy horizon turn ever-darkening shades of blue, from cotton candy to navy. Ahh, yes—this is what Emily and Ethan were chanting for. Back outside our cabin an hour later, we found comfy spots for stargazing. Ethan pulled out the field guide to the night sky that he had excitedly purchased just for this trip. I sat on the ground, legs criss-crossed, and my daughter rested the back of her head against them, face up to the night sky. I’d never seen stars so bright. We live in a suburban town, and I thought we had pretty good views of the night sky. But the low density of light pollution here creates the ideal conditions for stargazing. The expanse of moonless black sky overflowed with a riot of pinpoint lights. We looked for constellations. “Cassiopeia!” was Emily’s first excited exclamation of discovery. Those five stars outline an inverted crown. Our gaze traveled to nearby Ursa Major and Ursa Minor. Those were easily recognizable. It took a few more peeks at our guidebook to make out the constellations Draco and Scorpius. Sleep came easy to all of us during those nights in the dark silence. It was the deep, restorative sleep that rewards two active days outdoors. I felt recharged, revived and immensely glad that I had agreed on a family camping getaway. 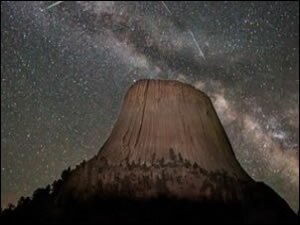 Even at my ripe age, I saw things I’d never seen before, like the architectural magnificence of Devils Tower, and the Milky Way’s ethereal glow in the night sky. I’ll never forget the excitement in my daughter’s eyes finding the fox along the hayride trail and all those constellations in the stunning night sky. 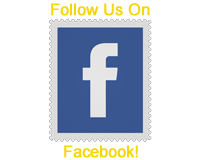 Discover more great KOA activities!